The North Shore Library welcomes all residents with a valid library card to sign on to our Word Processing and Internet Computers. Out of county patrons need to see a librarian for a guest sign-in. Minors under the age of 18 need parental permission to use the Internet. Each person is allotted 2 hours per day of computer use. There is a ten-minute warning issued before the timeout. Work can be saved to USB drive or to the cloud. Printing is available to our network printer: 10¢ for black & white or 25¢ for color per page. 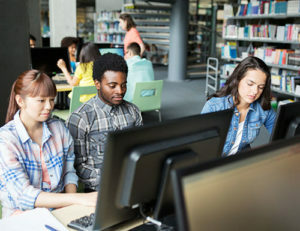 Bring your laptop into the library and connect to the Internet through our wireless network! You’ll need a laptop that has wireless capabilities with your own wireless card, and a valid, up to date library card. We cannot offer any hardware, such as network cards, to connect your laptop. Please call 631-929-4488 , or Email Tech Support if you have any questions concerning any of the above services. The Library has a fax machine at the Reference Desk for outgoing faxes only. The charge is $1.00 for the first three pages and .50 for each additional page. A $3.00 surcharge will be added for international calls. Please visit our newly expanded Online Research Page. The Library has acquired these sources to assist you with your information needs. Newspaper sources include The New York Times, Newsday, Riverhead News Review, the Times Beacon Record and Newspaper Source (U.S. regional newspapers). Consumer sites include Auto Repair Reference Center, Health and Wellness Resource Center, Gale Legal Forms, and much more! Many of these sites may be used from home with a valid library card. We also have two “Reference” stations with database (research) programs located behind the reference desk with no time limit.